What is organic gardening? And can it really help us towards a greener lifestyle? If you are interested in green living and you are lucky enough to have a garden - or even a back yard - then gardening organically is for you! This section of Greenfootsteps.com looks at why organic gardening is so environmentally friendly and explores some methods of "green" gardening. Even if you still use the occasional chemical fertiliser, there are still lots of ways in which you can make your garden greener - both literally and environmentally speaking! First, a little about organic gardening and why it is more environmentally friendly. A garden which is eco-friendly is a delight at any time of the year. It is buzzing with life and activity and you know that you are doing a bit towards the health of the planet. If you want to do more "green living", try organic gardening! Gardening using organic methods is not particularly hard. If you take advantage of well-adapted species and use plenty of good old-fashioned gardening techniques you can have a thriving, lovely garden in a shortish time. Yes, it does take time... but it's enjoyable, relaxing and healthy exercise in the open air. And you may feel inspired to grow some of your own crops, too, and so cut down your food miles! You can read lots of articles on how to grow vegetables and salad crops in the Grow Food section. And don't forget to check out the Orchard section if you would like to grow fruit. 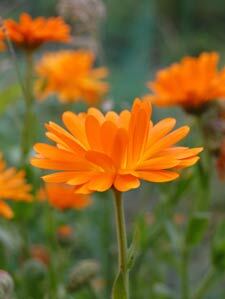 The pictures of flowers on this page show flowers grown solely with organic methods. No artificial fertilisers or pesticides of any description were used to grow them. Many species of birds, animals and insects rely on being able to travel and find suitable habitats as they go. They use places such as gardens as stop-overs on their journeys between their more permanent bases. As humans make it their business to colonise and ‘own’ more and more of the earth’s surface, many species are increasingly being squeezed out. Many creatures find themselves marooned in areas of their natural habitat which are cut off from other such areas - cut off by roads, houses, urban sprawl, building sites or industrial complexes. 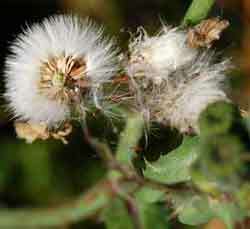 Picture: Even weed seeds can be valuable for wildlife. Communities of wildlife – butterflies for example, get more and more stranded in small communities so finding a mate, or even enough food to live and breed becomes a problem. By making our gardens and back yards friendly to wildlife we can help struggling populations of birds, insects and small animals. We can provide food and shelter for wildlife which helps them get from one bio-friendly area to another. We can do this wherever we live in the world (well almost! ), from temperate and cool climates to tropical zones. If you plan a garden using mainly natural, organic and non-toxic products, you will reap the benefits – and so will your local wildlife . But you can do a lot to provide a corridor along which butterflies, moths, hoverflies and birds can travel and you can enjoy seeing and hearing them as they use the space you help provide. So how do you make your outside spaces more user-friendly to wildlife? 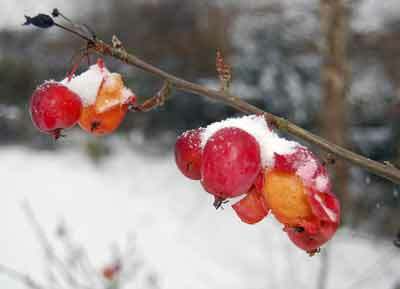 Picture below: Crabapples in the snow, ready to eat. Blackbirds love them. 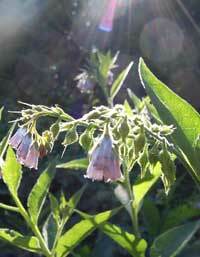 Plant plenty of native species and/or plants which thrive easily in your climate. Plant plenty of bushes, shrubs and trees which bear berries or other fruits for the birds. 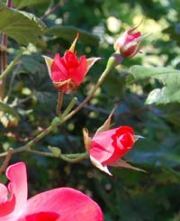 Rosehips are useful to the birds and colourful too! Plant herbs and flowers which insects such as bees and hoverflies love. Open pollinators are best. Feed the birds. You can also help with nesting sites. A pile of old logs in a corner can provide a great habitat for birds and insects. 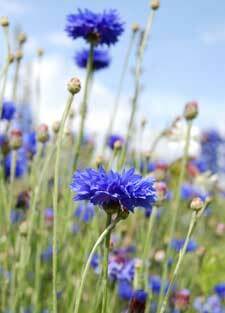 Don't be too tidy, as even weed seeds can be valuable fodder for some species. Use non-toxic products in your garden for all the jobs in your garden where products are needed. Don’t use herbicides and pesticides – they usually kill more than you bargain for, and some leave toxic residues. Practise organic gardening - which will usually deliver the results you seek, without poisoning the earth. If you have the space, put in a wildlife pond. Use companion plants in your vegetable plot if you have one. They are one of organic gardening's secret weapons! Choose plants which are well adapted to your garden's soil and situation and therefore do not need lots of fertilisers or extra watering to survive. Plant wildflowers and meadow flowers if you have room. Use mixed grasses or herbs such as chamomile for your lawn. Keep a compost heap - or better, two! A good compost to fertilise the soil and recycle waste is an organic gardening essential. Last but not least, everything you want to accomplish in the garden can be done through organic practices. So study up on eco-friendly gardening. It's a part of eco-friendly green living. 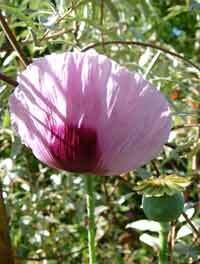 Below there are links to lots of different aspects of organic gardening, with an emphasis on helping wildlife too. For planting, sowing and growing tips for the different vegetables (mainly easy ones!) please see How to grow a vegetable garden and the articles listed there. There are more related articles in the Frugal Living section.